‘Day 10,’ she says in a long, hushed voice. I can’t believe we’re almost to the end. These things go so fast! Today our cute little friend Laura is here to share with us another of her quest to get all her Christmas photos scrapped. Three cheers to her for getting them all caught up! Let’s take a look at how she was able to take on such a task and get ‘er done. In my quest to get 6 years of Christmases scrapped, documented, and in the albums, I finally reached the last of the 9 layouts I set out to make over the last year. Kerri’s storyboard templates played a huge part in these layouts coming together easily and without much fuss, and I love that! 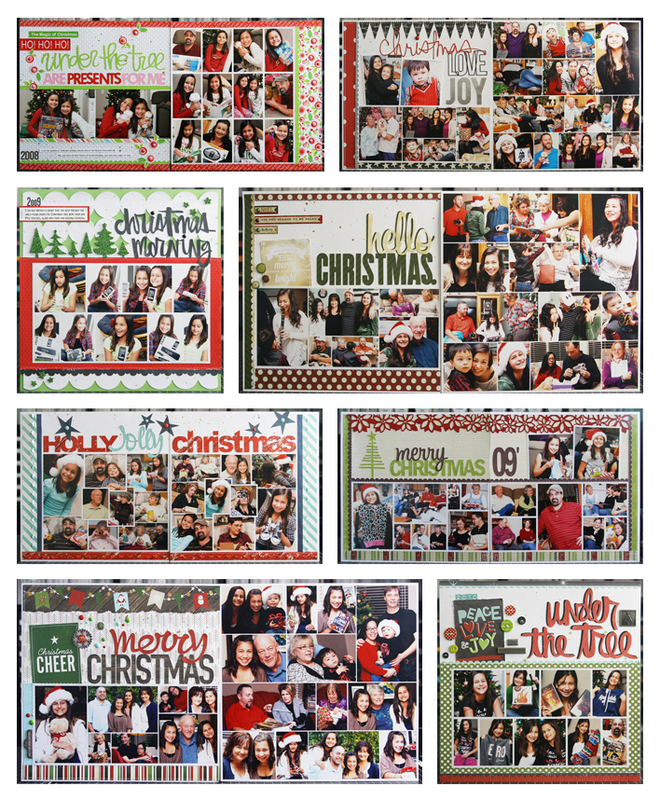 Every layout I created involved photo collages, and die cut titles, and minimal embellishments. By simplifying my process, it helped me tackle a holiday that I don’t necessarily enjoy scrapping. For this layout (above), I used a template from Kerri’s Storyboard #6 kit and sized it so that I would have a little room on both sides of the collage for some patterned paper and a little room above for my title. 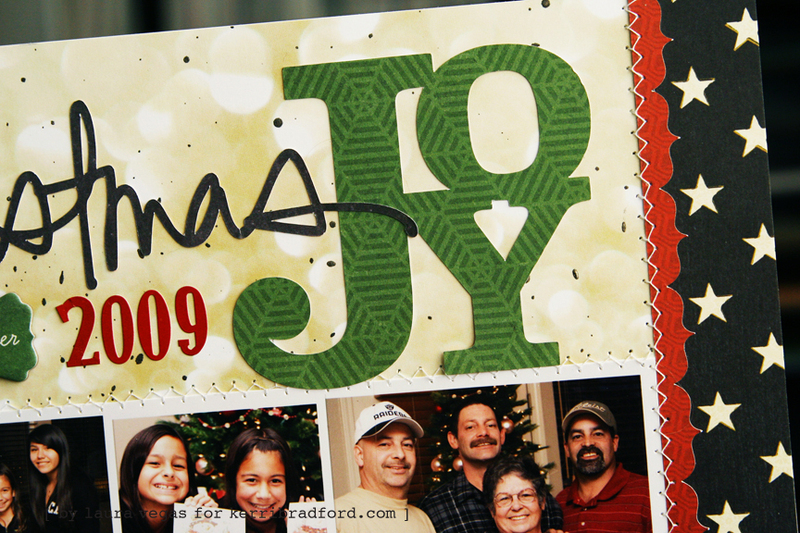 I combined two designs for my title, pulling the word “joy” from the Christmas Countdown kit and the word “Christmas” from the December Twenty-Five kit. I also used one of Kerri’s fabulous freebies, and cut the Border Fancy to go along both sides of the collage. 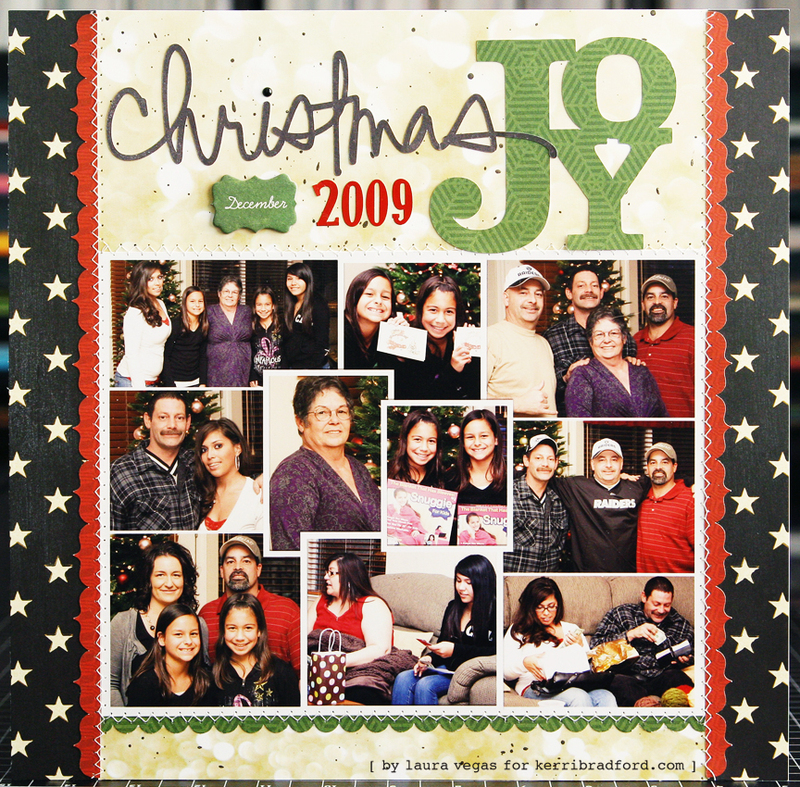 It felt so good to get all of those Christmases finished and in the albums. Now I just need to take care of Christmas 2014, since Christmas 2015 is right around the corner! What’s so amazing is how many photos Laura was able to get onto the one or two-page spreads. Same basic concept for all the pages, yet each one looks so unique! Photo templates can simplify the photo process greatly. I said it before and I’ll say it again, she’s my hero! I hope she has inspired you to tackle a big project the same way she’s inspired me! Today’s one-day freebie has dual meaning. I designed this–in addition to the new Hanukkah title in the store–with my Jewish friends in mind. 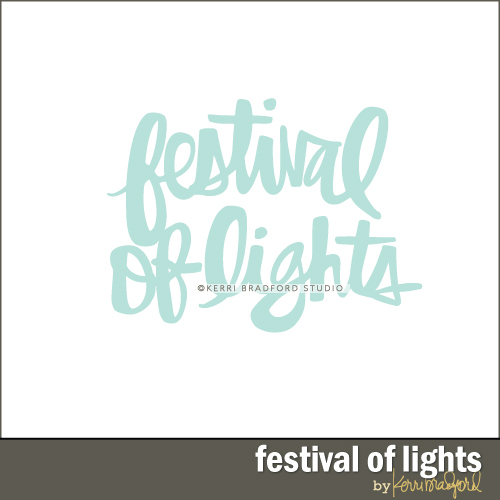 But since I believe a lot of ‘Christmas’ peeps also enjoy a different type of Festival of Lights in many communities, I thought this freebie could work for both December holidays. Not to mention you could always break it apart and use festival or lights on their own. This is no longer available as a freebie, but you can get it in the store. Last year we had the pleasure of having Miss Stephanie Bryan join our 12 Days of Christmas. 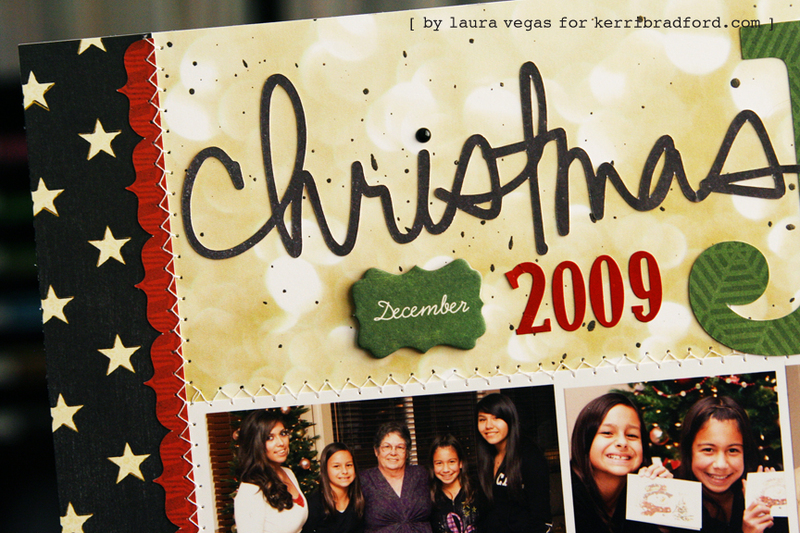 As I was perusing the Posts of Christmas Past I loved the idea of sharing another beautiful simple page layout using the same title as Laura. I love being able to see the same design used two ways at the same time. So take a look…and for more of a look, check it all out HERE. Yay for wonderful pages with all the Christmas happiness! Thanks so much for sharing your projects and progress! Wishing you lots of heartwarming moments to scrap this year! Thank you for the freebie, I will be going to LaSalette Shine this weekend and will definitely use this! 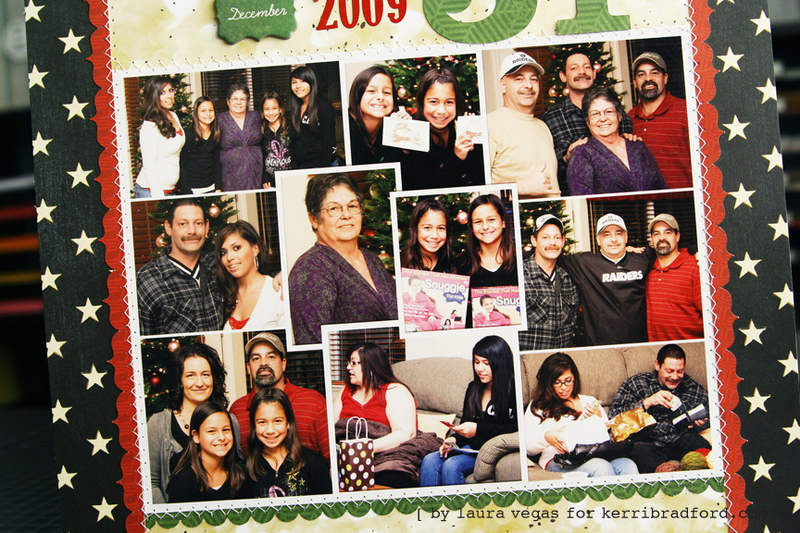 Love pages, Laura — beautiful that you were able to scrap all those photos! Thank you, Kerri, for today’s beautiful gift! It really IS amazing how using the same template can come out looking so very different and unique on each one! Great job!